Nato insists air strikes on Gaddafi forces are strengthening the rebels' position. While the southern Mediterranean was busy with Nato vessels as well as civilian ships involved in humanitarian aid operations, Naples received no information on any of them being attacked yesterday, the spokesman said. Earlier on Tuesday, wing commander Mike Bracken, Nato spokesman in Naples, said the alliance had foiled two Libyan regime dinghies seeking to attack Misrata from waters off the coast. One vessel sped away; the other was said to have been holding a metric tonne of Semtex explosives. “It was a floating booby trap,” Bracken said. Nato insists that air strikes on Gaddafi forces are tipping the balance in favour of the rebels in the lengthy stand-off for control of Misrata and that forces loyal to the regime have their supply lines stretched. 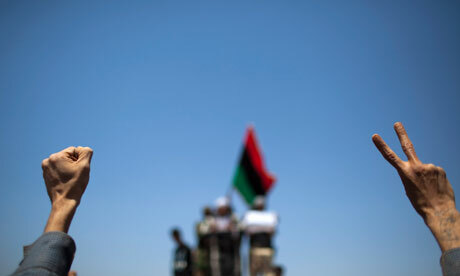 “Misrata is much safer than it was even a few days ago,” Bracken said.